Sayings can be pictorial and fun — like home is what makes the dream work or teamwork is where you hang your hat. Actually, I may have confused them, but what happens when you take four agents who are committed to their smaller town and to working with the same focus and determination toward success? You end up with an office where agents help, protect and enjoy one another though each is running their own business. You end up with Nick Huffman, Mandy Cady, Cathie Peterson and Bobby Perry. One cannot technically call this group a team since they are functioning independently of one another. They do, however, love the camaraderie that they have created and the culture of mutual respect and service. It all started with one agent who opened an office. Nick launched his passion for real estate right out of high school. It was difficult at times for people to look past his age, but Huffman loved helping people, and so he coached and counseled his way into their hearts. Nick knew that he must be committed to doing what would be uncomfortable, so he just labored tirelessly to let everyone know about his career. He loves to give back to the community, so he is constantly involved with non-profits and volunteering, and he served on numerous local boards. 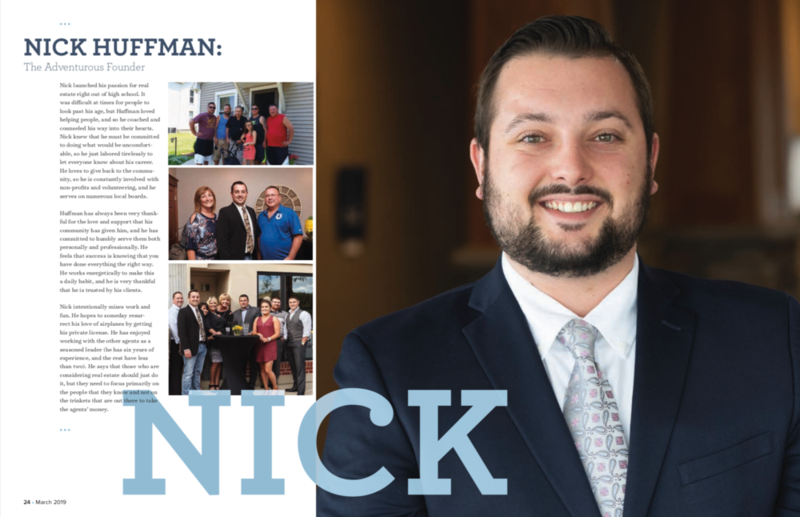 Huffman has always been very thankful for the love and support that his community has given him, and he has committed to humbly serve them both personally and professionally. He feels that success is knowing that you have done everything the right way. He works energetically to make this a daily habit, and he is very thankful that he is trusted by his clients. Nick intentionally mixes work and fun. He hopes to someday resurrect his love of airplanes by getting his private license. He has enjoyed working with other agents as a seasoned leader (he has six years of experience, and the rest have less than two). He says that those who are considering real estate should just do it, but they need to focus primarily on the people that they know and not on the trinkets that are out there to take the agents’ money. Many began her professional career with home-based business. She, too, loved houses (new and old) and people, so selling real estate was quite attractive. It helped that she, as a single mother of five, could work a flexible schedule to meet the demands of family. She enjoys making connections with people, and she loves the fact that every day brings something new to conquer. Cady has developed some very memorable experiences with her clients. Success for Mandy happens when she realizes that she is happy and fulfilled. She loves what she is doing, and she has the drive and motivation every day to make things happen. Clearly, her children are her “why,” and she considers them to be her greatest influence. Thought they range from 4 to 18, Cady says that it is impossible to have a bad day when you spend time with them. They help her to persevere. Mandy also loves to run, and she enjoys the beach and traveling. She also proclaims herself to be a concert junkie. Music is a must at her house, when everyone pours into the kitchen with much cooking and singing. For newer agents, Cady hopes that they understand that selling real estate is must harder than what most people imagine. There is no steady paycheck, and the entrance test for her was hard, but she still describes it as fulfilling. She is working on finding goof balance in her life. She says that if she could do anything in life, she would be a counselor. Until then, she will counsel people on the best place to live. Cathie was a licensed cosmetologist at first who also had some experience in restaurant management and network marketing. She had some adjustment (as everyone does) at the beginning, but she is determined to make decisions based on what is best for her family and the community. Peterson has loved every job in her career trek. Most all of them focused upon helping people. She carries her passion for servanthood home as well. She is married (17 years) to Matt, who is in sales as well. The family is quite involved in sports (cross country, swimming, and track). Cathie loves to vacation work out and go to the beach. Perhaps her favorite activity involves anything that makes her laugh. Cathie advises agents to never lose sight that you are dealing with real people and real lives. It might be easy to fall into the trap of seeing families as one more transaction, but caring agents should resist this mightily. She adds to this the element of making sure that she does everything that she could do in each relationship and process. To keep her head and heart in the right place, Peterson shares this biblical quote: “Work willingly at whatever you do, as though you are working for the Lord” (Colossians 3:23). She notes that the impact of this statement drives her to a spirit of excellence. Her grandparents were her greatest influencers. Her grandmother was gentle and consistent, and her grandfather emulated the idea of a complete servant leader. She seeks to carry on their example by living it. Bobby served as a mail carrier for seven years. He laughs that he made the change to selling real estate because it sounded fun. After walking a 13.5-mile route each day in any possible weather combination, it seems reasonable. He says that he loves the social aspect of selling. It is something that he was not used to before. He likes to be his won boss and loves the idea that he can live in self-motivation; he can make things happen instead of some boss telling him how to do his job. Perry lives by the idea that one must work until they no longer must introduce themselves. When everyone in the area knows him and understands what he does, he may then slow down a bit. Until then, Bobby hustles to meet the needs of his clients. Success for him lies in his ability to work to the point that he can “enjoy family and stuff.” He does not want to worry about life and happiness, so real estate is leading him to that goal. Bobby has been married for over two years to Allison, who is a probation officer. For fun and fulfillment, the two enjoy spending time with their 3-month-old daughter, Samarah. He is amazed at how she can capture his attention. Perry too has an interest in aircraft and space travel, but while on earth, he seeks to lead by example in living right and be respectful. He says that without the other three, he would never have succeeded in real estate. 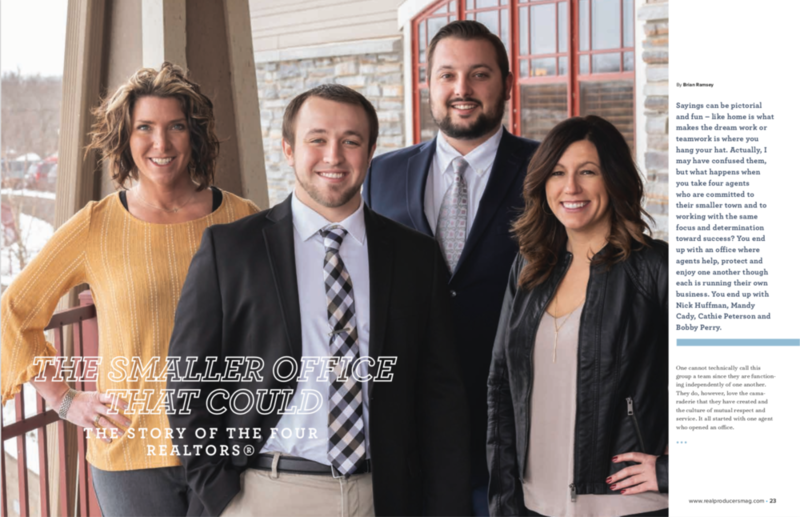 So much more could be said, but that is the story of four agents who said they could band together and make a difference. They are!